Around 60,000 U.S. Troops are already in place in the region. Washington's latest call up will make possible a total onslaught by late January. 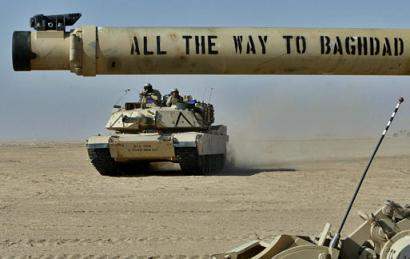 WASHINGTON - The Bush administration, concluding that Saddam Hussein is not serious about disarmament, turned Friday to convincing the U.N. Security Council that it should declare Iraq in violation of world demands and authorize war. At the same time, a senior administration official said Friday that President Bush has given the go-ahead to double the 50,000 U.S. troop deployment in the Persian Gulf region in early January. Defense Secretary Donald H. Rumsfeld is expected to sign the formal deployment order in the next week or two as part of what another official called "a ramping up on various fronts." "This situation cannot continue," Secretary of State Colin Powell said Thursday in describing Iraq's weapons declaration, submitted two weeks ago, as 12,200 pages of lies, gaps and omissions. Unless Iraq "comes clean" in the weeks ahead, "I'm afraid we should be very discouraged with respect to the prospects of finding a peaceful solution," Powell said. Bush will spend the next five or six weeks in pursuit of more evidence against Saddam while massing troops outside Iraq for a potential winter assault, these officials said on condition of anonymity.